This week we celebrate the feast day of St. Ignatius of Loyola, mystic, preacher and founder of the Society of Jesus. St. Ignatius was born in the family castle in Gipúzkoa in the heart of the Basque county of Spain. I have always been fiercely proud of my Basque heritage and take special pride in the two great Basque saints, St. Ignatius and St. Francis Xavier. Five years ago I had the privilege of traveling to the Basque country in northern Spain with my mom and younger sister. One of the highlights was a visit to the the aforementioned Loyola family castle and Basilica there. These are located in the town of Azpeitia, in the province of Gipúzkoa where Iñigo López de Loyola was born in 1491. To find out more about the family history and Basque influence on St. Ignatius you can read "The family history and childhood of Iñigo." The Basque people are known for their hospitality and gastronomic prowess. The Loyola family crest includes two wolves on either side of a hanging cauldron, symbolizing hospitality. What better way to celebrate the July 31 feast than with a traditional Basque meal. Basque cuisine is revered all over Spain and the rest of Europe. The cuisine is simple and frugal yet delicious - nothing is wasted, all the fruits of the hunt and harvest are used. I considered the classic specialities of angulas (baby eels), patas de cerdo con callos (pigs feet with cow's stomach), lengua (tongue), rabo de buey (oxtail - or you can use the tails of slain fighting bulls!) and settled on a few recipes that were likely to actually be eaten by your families (and mine). For extra flavor rub salad bowl with garlic clove. Clean lettuce and pat dry, break into bite sized pieces. Add onion rings and refrigerate. Place ingredients in jar. Shake and refrigerate until just before meal. Wash two cups red beans (small red bean , not kidney, if you can find them). Cook in four quarts size kettle until tender on medium heat (or to save time use 4 cans canned red beans- I've found at Kroger). In fry pan cook 3 strips bacon or salt pork, one medium onion chopped, salt and pepper to taste. Add to bean mixture with one 8 oz can of tomato sauce and simmer for at least an hour. These breasts are seasoned with a typical Basque mixture of parsley, garlic, and olive oil. 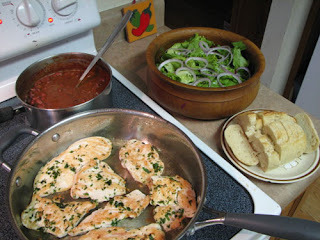 Cut chicken breasts in half horizontally to make 4 thinner pieces. Lightly sprinkle the pieces with salt and set aside. In a small bowl mix parsley, garlic, and 3 Tbsp. olive oil. Rub the mixture on both sides of the chicken pieces. In a large skillet heat 1 1/2 Tbsp. of oil over high heat. Add chicken pieces and cook about 1 minute. Reduce heat to medium and cook 2-3 minutes. Turn them over and raise heat to high and cook for 1 minute. Reduce the heat again and cook until cooked through. Increase ingredients accordingly if cooking for more that 4 servings. And of course, a nice loaf of artisan/peasant bread is always a staple to round out the meal. This delicious almond cake is named in honor of St. James the Greater, the patron saint of Spain. It originated in Santiago de Compostela, Galicia, the reputed burial place of St. James. 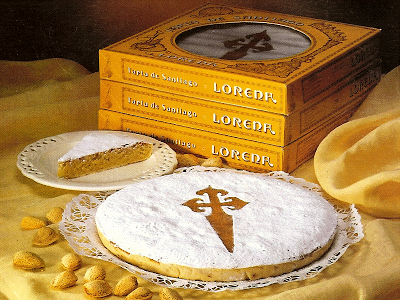 Today, this cake is sold all over Santiago de Compostela and is quite popular with both tourists and pilgrims. Heat the oven to 350 F degrees. Grease a round 8-inch spring form pan. Blanch the almonds, then using a grinder or a food processor, grind the almonds until fine and set aside. In a large mixing bowl, beat the eggs and sugar together. Add the butter, flour, baking powder and water and beat with an electric hand mixer. Stir the almonds into the batter. Grate the lemon and add the zest and stir until thoroughly mixed. Pour batter into cake pan. Bake in oven on the middle rack at 350 F degrees for approximately 45-50 minutes. Check after 45 minutes. Cake is done if a toothpick inserted into the center of the cake comes out clean. The traditional way to decorate is to sprinkle powdered sugar on the top, with a cutout of a cross or a shell, to symbolize St. James, on top. To make a cross, you can print out this picture of the cruz santiago that I am going to use, or you could use any clean piece of paper folded in fourths to cut out a cross. Then, after the cake has cooled, place the cross in the center of the cake and dust the top with powdered sugar. Saint James the Greater ~ Pray for us! 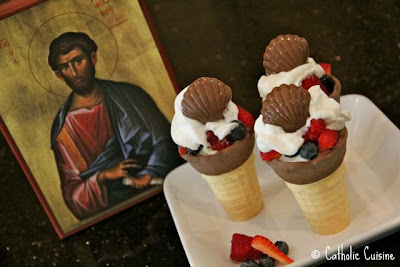 Our favorite treat for the feast of St. James is Coupe Saint-Jacques (Ice Cream Cup St. James). In Cooking with the Saints , the author says to "Put any mixture of fresh fruits in season in a parfait glass. Pear, grapefruit, orange, and dark grapes or strawberries make a delicious combination. Spoon lemon sherbet over the fruit. Top with a spoonful of chocolate syrup if desired." In My Nameday -- Come for Dessert , the author suggests mixing "two or three kinds of fruit with two or three kinds of ice cream neatly arranged in deep glasses, flavored with liqueur and garnished with whipped cream." Personally, I don't think there is any wrong way to make an ice cream cup! The feast of St. James the Greater is celebrated on July 25th. A couple years ago I ran across the following recipe online. In Cooking with the Saints, the author points out that scallops are called "Coquilles Saint-Jacques" in French, and therefore the majority of recipes associated with St. James contain scallops. So, this would be a perfect appetizer to serve in his honor. Doesn't it look delicious? Madeleine is a French form of Magdalen (Mary Magdalen, a disciple of Jesus, is mentioned in all four gospels). Preheat oven to 375 degrees F (190 degrees C). Grease and flour twenty-four 3-inch Madeleine molds. In a medium bowl beat eggs, vanilla and lemon zest with an electric mixer on high speed for 5 minutes. Gradually beat in the confectioners' sugar. Beat for 5 to 7 minutes or until thick and satiny. Sift together the flour and baking powder. Sift one-fourth of the flour mixture over the egg mixture, gently fold in. Fold in the remaining flour by fourths. Then fold in the melted and cooled butter. Spoon batter into the prepared molds, filling 3/4 full. Bake at 375 degrees F (190 degrees C) for 10 to 12 minutes or until the edges are golden and the top s spring back. Cool in molds on a rack for 1 minute. Loosen cookies with a knife. Invert cookies onto a rack and cool. Sift confectioners' sugar over the tops or melt semi-sweet chocolate chips and dip the tips in the chocolate. Store in an airtight container. Today, inspired by Anne, I made a Brown Scapular Cake to celebrate the feast of Our Lady of Mount Carmel. For our cake I used a simple yellow GOLD cake mix (baked in a 9x13 pan and cut in half) and topped with chocolate brown frosting. I used two brown pipe cleaners for the cord, and then decorated it with some white frosting. shall not suffer eternal fire..."
Speaking of the upcoming feast of Our Lady of Mount Carmel and Coffee... I thought I would take this opportunity to draw your attention to the Carmelite Monks in Wyoming. In order to build an abbey and support themselves, the Carmel of the Immaculate Heart of Mary is roasting and distributing Mystic Monk Coffee. Mystic Monk Coffee is roasted by the Carmelite Monks, a Roman Catholic monastery in the silence and solitude of the Rocky Mountains of northern Wyoming. The monks live a hidden life of prayer and contemplation in the pursuit of God. The monastery is inundated with young men who seek to leave everything to pray for the world, in a tradition at least a thousand years old. It is the monks’ great joy and privilege to share the fruit of their life with you in every cup of Mystic Monk Coffee. We are especially fond of this particular Carmel, are currently Guild Members, and my husband even had the opportunity to visit since his brother spent a few months there before returning to the FSSP. The night before last, I sat here trying to think of something to bake for the feast of Our Lady of Mount Carmel, which is coming up on July 16th. I was looking for ideas online, and in various cookbooks, and wasn't having very much luck. I started thinking that it would be so neat to make a dessert based on the Brown Scapular. I didn't really know exactly how I would be able to pull it off, but today I received an email from Kimberlee directing me over to Under Her Starry Mantle. It was just what I was looking for!!! In the Feast Day Cookbook , Katherine Burton recommends making Granita di Caffe, a cool and refreshing Coffee Ice beverage, for the summer time feast of Our Lady of Mount Carmel. Stir the sugar into the warm water until it is melted and add the lemon juice. Stir for about five minutes. Add the coffee, strain, place in a freezing tray, and then freeze (stirring frequently), until it becomes a mush. Another option for the feast of St. Thomas would be to make Chaldean Coconut Cookies. In her book, A Continual Feast, Evelyn Birge Vitz recommends making Chaldean Coconut Cookies for the feast of St. Thomas. She says that "these triangular coconut cookies are served at First Communion parties among Christians in such countries as Iraq. According to their tradition, Saint Thomas the Apostle on his way to India brought the Gospel to the Chaldeans of Babylon and Assyria." In a small heavy saucepan mix the sugar and water. Stir over medium heat until the sugar is dissolved. Let the mixture come to a boil and skim off the foam. Let cook, stirring constantly, until the mixture registers 240° F. on a candy thermometer. Let cool. In a bowl beat the eggs lightly, and add the remaining ingredients. Stir in the sugar syrup. Knead the dough gently in the bowl with the palm of the hand and the fingers for about 5 to 7 minutes. Take balls of dough a little larger than a walnut. Using a spoon or your fingers, form each ball into a flattish triangle about 1/4 inch thick. Place the cookies on greased baking sheets. Bake them for 35 to 40 minutes, or until they are very light brown. *If I have a chance to make these, I will update with a photo. The feast of St. Thomas the Apostle is July 3rd. In honor of his feast, I am planning on trying out the recipe suggested in Cooking with the Saints for Thomasstriezeln (St. Thomas Fingers). They look delicious, and not overly complicated to make. Butter a 14x6 inch baking sheet and roll out the dough on it. With a pastry cutter, cut the dough into long fingers. Brush with melted butter. Mix powdered sugar with cinnamon and dust fingers thoroughly with the mixture. Cover with a towel and let fingers rest in a warm place for about 40 minutes. Bake at 350 degrees F until golden. Approximately 30 minutes. You know, the more I use this cookbook, the more I am loving it... Now, to make those fingers! St. Thomas the Apostle ~ Pray for Us!